In command of the world’s largest hydrocarbon reserves and occupying a central role in both Middle Eastern and global politics, the six traditional monarchies – Saudi Arabia, Bahrain, Kuwait, Oman, Qatar and the United Arab Emirates (UAE)– that comprise the Gulf Cooperation Council are now among the most heavily researched yet most commonly misunderstood actors in the international system. Christopher Davidson, an acclaimed expert on the fast moving politics and economics of the Gulf, together with five other leading authorities on the region, has brought together a unique collection of comprehensive yet highly accessible analyses of these six states. Following a succinct theoretical overview of the various achievements, opportunities, and collective challenges faced by the monarchies, each chapter discusses their individual historical backgrounds, political structures, economic diversification efforts, and future prospects. 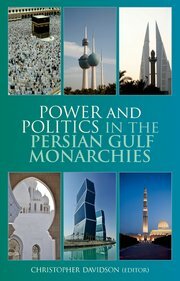 Drawing on the latest research in the field, the most up-to-date statistics, and written in a frank and critical manner, this textbook is a valuable addition to university reading lists on Middle Eastern studies or political science, while also appealing to the general interest reader.